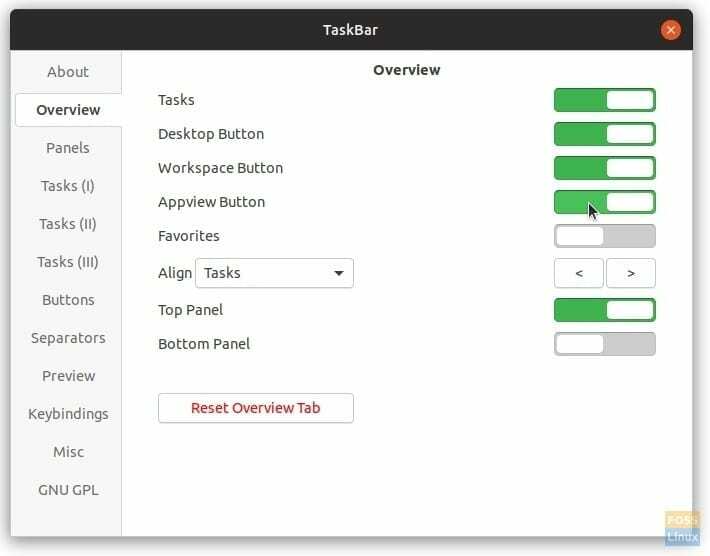 The top panel (commonly known as Taskbar) can be greatly customized to include some cool features such as adding a “show desktop” icon which minimizes all the open windows and shows the desktop, displaying icons of running applications, changing color, opacity, and more. So what do you get is a cool taskbar which is compact and more useful. You can also add apps icon, minimize all windows with one click, and switch workspaces too. Here is how to enable all these features. This guide will work only on Ubuntu with starting from GNOME 3.10. Step 1) First thing to do is enable GNOME extensions on your Ubuntu PC. Refer our tutorial using below link and then continue to next step. Step 3) Toggle the slider to “ON” position. Step 4) You should immediately see the new taskbar features applied to the top panel. 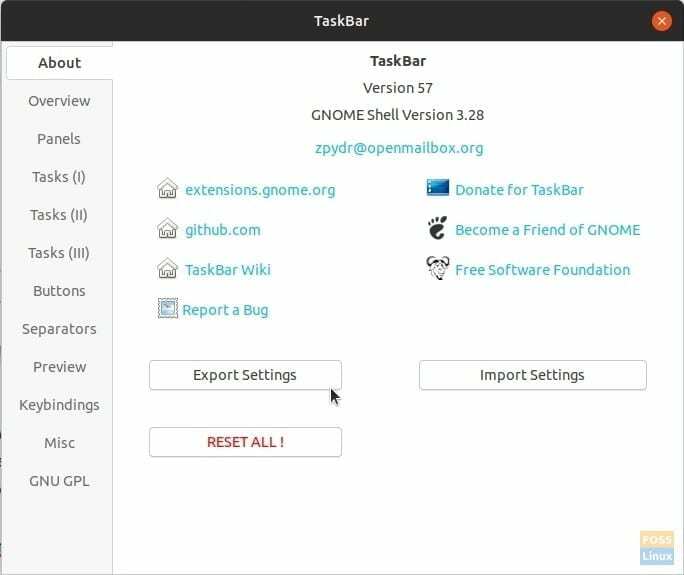 In order to configure the settings, refresh the TaskBar extensions webpage. You should see the settings icon right next to the “ON” button. Click on it. Step 5) You can now adjust the Taskbar settings. “Overview” tab lets you manage the several features of the extension. For example, you can disable “Appview Button”. Or you can add a “Bottom Panel”. 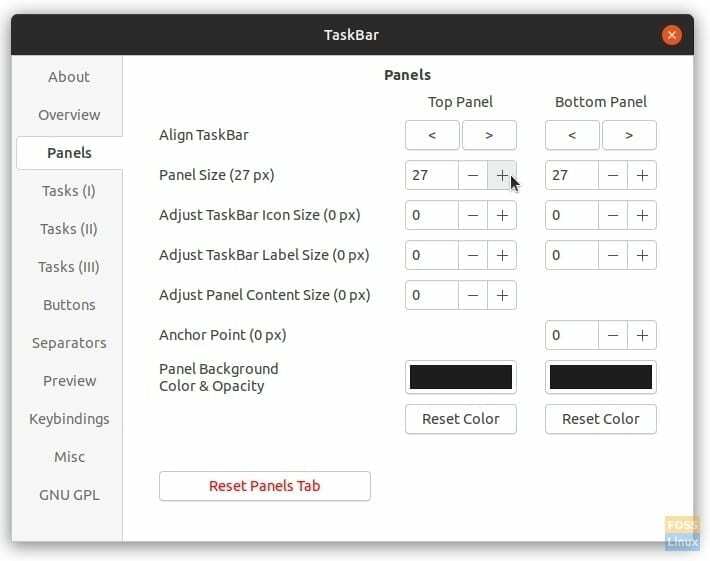 Step 6) “Panels” tab lets you manage the Panel size, taskbar position, icon sizes, and also the panel background color with opacity control. There are also a pleura of things you can tweak such as closing tasks with a right/middle click, activating tasks on hover, Scrolling tasks/workspaces, keybindings, etc.. I will let you stroll through the settings and figure out how you want to configure the taskbar. However, I would like to live highlighting a handy “Import/Export Settings”. When you are done with tweaking the settings, you can use the export button to save the settings so that you can import it whenever needed in the future. It will save a bunch of time. You will find the feature misplaced in the “About” tab. I think it should have a tab on its own!